My current collection of wheel-thrown stoneware ceramics includes large platters, tall vases, lidded forms and pod jars, which can be handled, used and displayed in domestic settings. The work plays with contrasts – shadow and light, detail and restraint, coarse and smooth. Visual and tactile qualities vary from an elemental, scarred, raw-earth warmth to a light, smooth and subtle clarity. I combine different clay bodies to exploit their distinct characteristics and to achieve a range of textures and earth tones. The pleasure, rhythm and meditative nature of wheel throwing encourages me to explore and develop subtle changes in the form and profile of my shapes. The surfaces are scored with lines and marks of slip using a variety of mono-printing techniques. 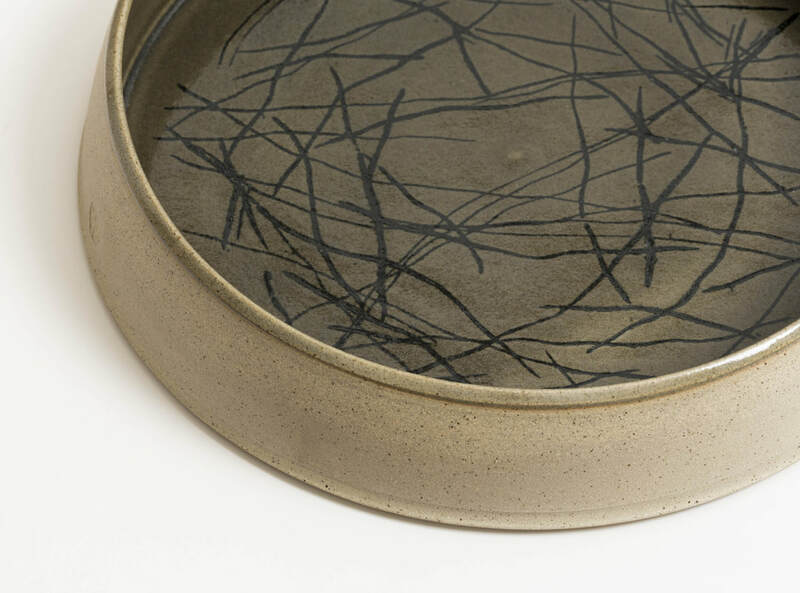 The application of warm matt or luminous glossy glazes contrasts with and compliments the unglazed areas of fired clay.